Trucker Martin van den Brink is the first Dutch person who drops out in the Dakar Rally. 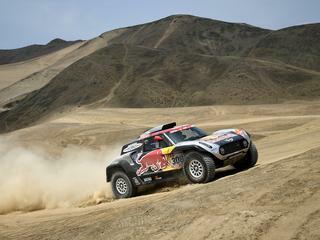 The driver of the Mammoet Rallysport is Wednesday in Peru do not start in the third stage. Van den Brink crashed Tuesday in the second leg with mechanic Mitchel van den Brink and navigator Wouter de Graaff. The truck came to a high sand dune, after which he down rolled and four times about the head hit. The trio was unharmed, but the truck is too damaged to Wednesday to start. The rally may not be all over for Van den Brink, because of early drop-outs may, for the first time after the rest day (Saturday) to re-start. The disappointed Van den Brink blames the crash on failed technology. “We had only five working cylinders”, he tells RTL GP. After the first two stages are race-car driver Bernhard ten Brinke and trucker Gerard de Rooy, the highest ranked Dutch in the Dakar Rally. Both of them occupy the second spot in the standings. The trucks are also Tons of Genugten (ninth) and Maurik van den Heuvel (tenth) in the top ten. The third stage is Wednesday, about 331 km and leads from San Juan de Marcona to Arequipa. The Dakar Rally this year for the first time in one country and finished. Next week on Thursday to reverse the caravan in the tenth and final stage is back in the Peruvian capital, Lima. Approximately 70 percent of the entire trail consists of dunes and sand.